The conduct of Christians is the path to eternal life. Grasping the understanding that your conduct is not merely a belief but is the Way of life expected of Yahweh’s children to bring eternal bliss to creation. It is a part of the Way. The Way is the path that leads to Yahweh and keeps you firmly planted on the path of righteousness. Your conduct should be within the mold you were patterned after by the example given by our Lord and Savior Christ Jesus. Molded as though you were re-created and refined within the furnace of Mount Zion, leaving behind the old imperfect attributes of willful sin as though they were smelted away. Carefully follow the pattern set in stone. It is your foundation the truth rests upon. Yahweh supports that truth. Make the Way unshakable in your mind and heart. Try not to stumble. Keep in mind that you’ve entered a narrow door and are walking on a path laid out by commandments. And children, who is your Father and your Mother? Yahweh of course, for you are all Her children. He instructs as your Father, and She teaches as your Mother. Fill your minds with that wisdom from above. Three things that are unified in guiding you in the Way. The Pattern of Christ. Our conduct should be as close to his molding effect as it possibly can. If we are not molded in his likeness then we are not Mother’s children. The example is laid out in Christ Jesus who set the standard we all must learn to imitate. Each of us walk in the steps of our Christ, following him into his Kingdom. In this Way, we avoid the traps and snares laid on the path by Satan and his family of deceivers. Our conduct must be above reproach. We should strive to be a reflection of our Christ whom also reflects our Mother. We will either give credit to Mother, or if we act abusively we will discredit Her. We also should not hate the evil people of this world. They are victims of Satan’s empire that is going down in ruins. They are in a sea of sin that is drowning each of them. If we serve our Mother in this time of peril for those that are drowning, though they might not realize it, we are here to throw them a life saving preserver – that being the Word of Truth. All any of us can do is throw them the preserver, then if they fail to take hold and be pulled into safety, you have done all you can do. You have done all that our Mother expects of you in your conduct towards those that are drowning. Forcing one to take hold of the preserver is not what our Mother wants or expects. If a person refuses the gift of mercy shown, then there is a reason, and it is part of a free will decision on their part. Part, because Satan certainly influenced their decision, so he stands firmly accused and charged as a man-slayer as well as other sins charged against him. Mother does not seek to force Her Sovereignty on any intelligent creation. 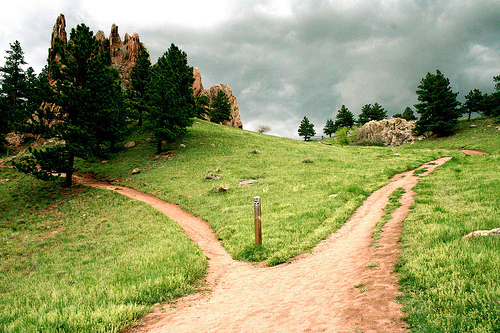 The decision to move on the path toward the Kingdom must be one of free will to do so, or to decline the offer. If we try to overly persuade, or even to force what we know is beneficial to them and others upon them, then we are taking away their free will choice. This is what Mother does not want as an over zealous faucet of our conduct in sacred service to Her throne. If our Mother wanted that, then She would simply alter their thinking and their heart conditions, but that would not be free will at work. The desire for salvation must come from within each individual person’s heart that becomes in sync with their mind as they seek to discard their old personalities and put on the new personality that Mother is looking for in all of Her loyal Kingdom Subjects. This is why She says to proclaim the truth in all the earth, but does not say to force it upon anyone. This has been the case throughout time, even before Mankind came into existence. There have been many kingdoms throughout the expanse that chose not to serve under our Mother’s Sovereign Authority and Rule. A patter was set early on to destroy those that do not make a free will decision to serve under righteousness and Mother’s Law. Both Mother Yahweh and Christ are rocks of perfection. Both foundation stones that we rest upon. They are spoken of as a pair. At the top of Mount Zion they are joined together for eternity on the ring of the Holy Mountain top that overlooks all of creation. They are spoken of as though one in that they are in unity with one another. You cannot have one without the other, and so they are joined together serving as the two corner stones that all of creation rests upon. Christ within Yahweh, and Yahweh overshadowing Christ. Pray that you never see the gates to eternity by being under a judgment of eternal death. Beyond those gates are the shadow of our Mother. Yahweh represents both a Life-giver/Sustainer, and the ultimate Judge over who is expelled outside of Her body into eternal/eternity’s death. Comprehend this so that you never suffer being spewed out of our Mother’s mouth into a death state you cannot be brought back from. What is the most valuable thing you possess? Nothing of material possessions. It is the love that our Mother freely gives to Her children that love Her in return. How do you show Her you love Her also? By following Her commandments to the best of your ability. But, what of those that prefer worldly possessions over Mother’s love? The floodwaters compared with being swept out and away from our Mother’s body into eternity where it is referred to as the pit. To be in the vastness of eternity that is deep and has no end. It is to be lost forever with no chance of being redeemed. It is outside of the protective nourishing wings of our Mother. Why place the executed into the eternal void or pit that serves as total destruction of the non-salvageable wicked? The answer is because that’s where our Mother is from – Eternity. She sweeps Her house clean, because the waste does not belong inside a home that is meant for order and cleanliness. She appoints Her angelic hosts as executioners. She reveals Her superiority, because Eternity cannot harm her. She is part of Eternity, and it is Her own true home, just like Her body/reality is ours. But in the flowing Eternity that is like a river, it washes away those that resist our Mother’s Sovereign Rule and covers them over in the pit of oblivion. Don’t each of you sweep your homes clean? Have you not been taught that the demons are considered mere waste for the heap? And one last thing. Who normally sweeps a home? Isn’t is usually the female, where there is a union of at least two? And, who normally uses the term “My beloved,” is that not a woman’s spoken word of affection toward a loved one? Satan had his hour. Soon our Mother will have Her hour also. Whatever is to do with Her is to do with Her’s and Christ’s flock. “talking with us on the road” is symbolic of the path to the kingdom. Who do you find on the path that is your example? It is of course our Lord the Christ Jesus. The Word is the Living Word or mind-set of Christ and our Mother Yahweh. In effect, it is alive. It is a heart motivator for those that accept the truth with an open and loving heart, and a closed topic to those that refuse to accept it. The question is: Will they change their attitude or ill mind-set when Christ reveals himself at the lifting of the veil, and exposes Satan’s presence to the masses?” The eleventh hour as a revelation is symbolic of this: “That very hour they got up and returned to Jerusalem. They found the Eleven and those with them gathered together, who said, “The Lord has certainly been raised, and has appeared to Simon!” The eleventh hour is composed of those that are faithful (symbolic of “They found the Eleven”), like this ministry, and others spread out around this planet, “and those with them gathered together. ” Those with them are actually all those on this earth that will see the revelation. Everyone on this planet will then know in their hearts that “”The Lord has certainly been raised,” and it will then be a determination of the heart. And on the “Eleven,” please keep in mind that they are minus being complete at that time. 12 plus Christ makes the complete number in symbolism. So, one must be added to the equation. That one is the symbolism of “the light of this world” that being Christ, lighting the Way to those given the opportunity to see what was hidden and then quickly make a decision, just like those that pass over. They see and realize this is truth, so at that time a decision of the heart must be made. A double meaning. The hour has already been in progress for this ministry. But an hour is also coming for those yet in the dark. So, our Mother Yahweh whom is also our Father “wants such people to worship Him.” As Jesus taught by not only words, but also action, this set an example of what he would do in the end times. Revealing the expulsion of Satanic influences over the people that took note of him, and even raising those deceased that did not yet know him. So, people of this world are generally dead in the sense that unless they alter their thinking and inner feelings to comply with Christ’s Ruler-ship, they remain dead in his eyes and our Mother’s eyes at the Eleventh hour. However, the fact that he raised from death those that had not yet come to know him corresponds with those that pass over and and are given the opportunity to hear the truth and make a free will decision one way or the other. In further symbolism, those of the Eleventh hour that accept the truth, they are compared to those that also then cross over from death to life. Mother is the One that actually gives life, so hearing Christ’s voice the Eleventh hour is what can bring them over to Mother’s family and can live without experiencing the wrath of Mother’s judgment for the remainder of mankind. Christ’s disciples are taught that Yahweh is also a woman. She gave birth to Christ the same way Mary did. Without aid of another father, because Mother is also Father. Mary’s human vessel served to make Jesus human in the Jewish line of decent, but Yahweh gave him hack all of his original attributes he possessed in Heaven. Therefore Christ entered the Adamic line, but at his reanimation he was restore with the second half he had had in Heaven, which was his spiritual body. He was no longer of Jewish decent because that former trait of mankind that was necessary to fulfill the sacrifice also died with his human vessel on the Cross of Salvation. He had passed into death as a perfect Jewish descendent of mankind, and was raised back to life as not only Michael the Word, but also the Anointed King Christ Jesus chosen by his original Mother. “cultivate >verb 1 prepare and use (land) for crops or gardening. 2 raise or grow (plants or crops). 3 grow or maintain (living cells or tissue) in an artificial medium containing nutrients. 4 try to acquire or develop (a quality or skill). 5 try to win the friendship or favor of. 6 [cultivated] refined and well educated. -ORIGIN Latin cultivare, from cultiva terra ‘arable land’. Dawn prepared to use Mother’s property (the earth) for growing his own crop in his own garden – verses the Sacred Garden of Eden – the crop being mankind. Then, they cause the fall of many of his brethren from Heaven by having them materialize in the pre-flood era, so: “grow or maintain (living cells or tissue) in an artificial medium containing nutrients” The fallen angels bodies were counterfeit, and therefore they were considered artificial even though they flourished by taking in essential nutrients for their foreign flesh. They were considered freaks by Mother because they were not of the Adamic line She started humankind off as. However, and most importantly, other flesh can exist, so they flourishes just like the animal kingdom because they are not humans either, and neither were those fallen angels. To be human one must be complete in the creation process that involved making Adam from the dust of this planet, and they simply put on flesh and blood clothing over their spirit bodies. This was an abomination in Mother’s sight, and She considered them the same as if they were from the animal kingdom, because She compares them to beasts: Job 41:34 “He surveys everything that is haughty; he is king over all the proud beasts.” From there, you can puzzle together that Satan is proud, and is called a dragon and serpent – both meaning a proud beast. No less are the other fallen angels considered in the same way: Daniel 7:12 “As for the rest of the beasts, their authority to rule was removed, but an extension of life was granted to them for a certain period of time.” At Armageddon their authority to serve as rulers under Satan will be terminated, but at the end of the Millennium they will be reanimated – “an extension of life was granted to them” and Satan as well,”for a certain period of time.” That will be the final test of having tempters. Please note that they are granted life for a predetermined length of time. This part of the puzzle ties in with Revelation 20:7 “[ Satanic Rebellion Crushed ] When the 1,000 years are completed, Satan will be released from his prison and will go out to deceive the nations at the four corners of the earth,” “4” also represents squared justice. So, squared justice will be brought to the entire earth to rid the final rebels from creation. Festival of Harvest signifies the first Rapture. The end of the year signifies the final gathering of any mandrakes. The mandrakes are the ones that are uprooted from Satan’s empire by giving up Satan’s bad medicine (lies) and magic (mixed with deception) he had used to entrap them and keep them blinded. mandrake >noun a plant with a forked fleshy root supposedly resembling the human form, used in herbal medicine and magic. -ORIGIN Latin mandragora; the form mandrake developed by association with man, because of the forked shape of the root (formerly believed to shriek when pulled from the earth), and with drake in its Old English sense ‘dragon’. During the first Rapture the mandrakes will be sought for later removal if they accept Christ and are of good heart. They are the ones that are like the fallen angels that resembled humans in their form they took on. They will be given the opportunity to be uprooted from this dying world and receive Salvation, but the time for uprooting could run short, so there’s no guarantee you will receive the second Rapture. “”Please give me some of your son’s mandrakes.” Some will undoubtedly make it, but “some” is not all. These mandrakes are people you all might personally know children, and you feel if they saw the veil lifted they would believe and become uprooted from Satan’s clan. They could become a small harvest of new wheat, or they might remain chaff. Only time will tell. This is also a tie-in. Luke 15:6 “and coming home, he calls his friends and neighbors together, saying to them, ‘Rejoice with me, because I have found my lost sheep!’? This entry was posted in Christ Jesus, Christian Conduct, Demons / Fallen Angels, Eternity, Mary, Rapture, Satan / Dawn Lucifer, The Eleventh Hour, The Narrow Path, Time, Woman, Yahweh and tagged Armageddon, Christ Jesus, Christian Conduct, The Disciples, The Eleventh Hour, The Narrow Path, Tribulation, Truth, Yahweh. Bookmark the permalink.